It's the first Friday of the month! And I have another wonderful interview with a steampunk of colour to share this month after a couple of months of brain-gone-somewhere! This month, we head back to the Pacific Northwest to Portland, again, where resides Beth Aileen Dillon, Anishinaabe Mètis, who is currently a PhD student in the Interactive Arts and Technology program at Simon Fraser University, and a transmedia artist. She's been featured here before, when she released her short video The Path Without End, in which she uses everyday objects and materials to create an animated film that re-tells the story of a child that is the offspring between an Anishinaabe and Moon Person. Her latest work is The Nature of the Snake which premiered at the most recent imagiNATIVE Film and Media Arts Festival. In it, she uses silhouettes and cosmic imagery to tell the story of a snake and a girl. Also, she has given me permission to feature her latest painting, "The River of Star Beings" (to the right!). Beth Aileen's approach to steampunk is really unique compared to most of us out there; we talk about using everyday objects for creating beautiful things, and she takes it to the nth degree and uses them for storytelling. Steampunks can talk a good game about bringing back old stories of adventure, and she brings forward a storytelling tradition of her people. How did you first hear of steampunk? What were your first impressions of it? As far as the origin goes, props to William Gibson and Bruce Sterling for their impactful work that launched the steampunk SF genre. Of course, fiction has its cultural shortfalls. Native representations were often no different there than in any other media, which is where my self-determination comes in. Aesthetically, I was around steampunk by living in Portland, Oregon, where the genre manifested as a fashion staple. I have since traveled around Canada but recently returned to PDX. The city is lively and draws in work from cool technologists-artists-researchers like Tanenbaum Fabrications. Where they bump up the Victorian vibe, I tune in with chokers, necklaces, and earrings made with copper, bone, and beads. My hope is to mix bright colors like old trade beads in with the usual brass and copper tones. You can be colorful and still be steampunk. Tell us your feelings about steampunk in general, as it is. I have been naturally drawn to the steampunk style in my presentation of myself, my writing, and my art. I came to the steampunk term by finding out what I was being defined as, not as how I necessarily defined myself. Lately I have found that what I mean by “steampunk” doesn’t involve steam technology, but rather plays on acknowledging Indigenous scientific literacies and genuine Indigenous science knowledge. SF reaches further back and can be found laced in traditional Indigenous stories. I seek to uncover, revisit, and reimagine Indigenous SF, which may tap into steampunk but may also be more aligned with greenpunk. 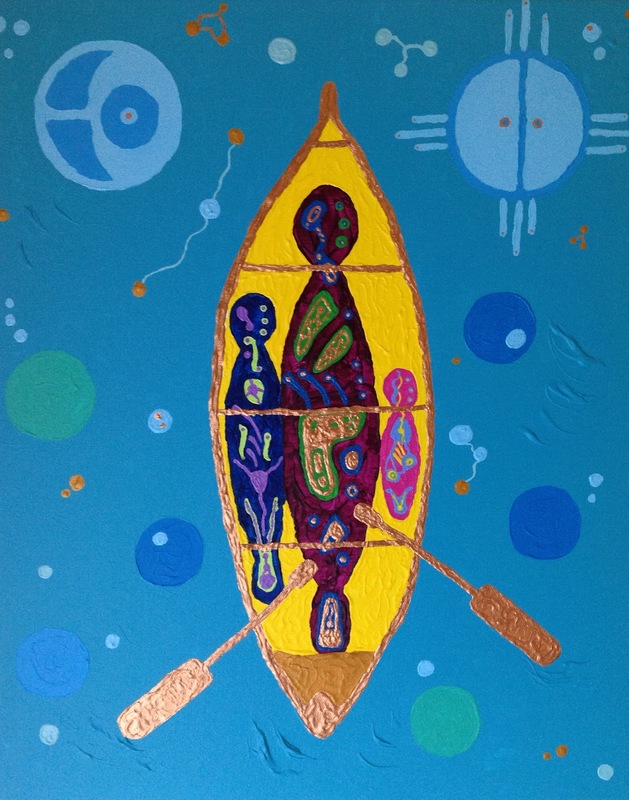 Anishinaabeg have stories of space traveling copper canoes. Cosmic travel. Natural mining techniques. This is science. This is the knowledge of the People. My work draws from tradition and alternate imaginaries. Could you tell us a bit (or everything) about the process of making The West Was Lost? 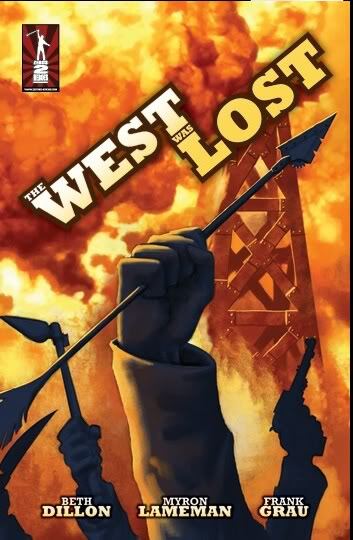 The West Was Lost started out as a pitch in the Zeros2Heroes Comic Book Creation Nation contest. I based most of the characters on Indigenous actors who were at the time living in Vancouver, British Columbia, with a film or television series in mind. I was pregnant with Malcolm and spent then and into the early months after his birth (which was a bit traumatic since I had HELLP Syndrome) collaborating with the artist and the editor Andrew Foley. I would outline the story and describe the scenes, Andrew would do a visual mock up for format, then we’d reiterate as needed before the artist Frank Grau Jr. did his thing. Andrew advocated to have Frank on the project, which I’m thankful for, since his work was an absolutely perfect fit. I debated personally around non-linearity and linearity, but Andrew, being very understanding and intrigued as someone very familiar with the complexities of reading comics and seeing my intention, embraced the structure. 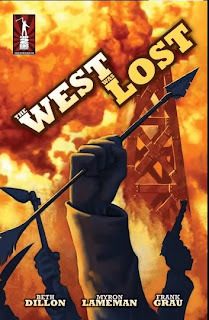 What resulted was The West Was Lost, a story with many more stories left to be told! The property is currently in development as a television series. In a post your video "The Path Without End," you talked about getting "fed up with the inability of words to capture your vision of steampunk." Is this vision of yours predominantly visual? Could you describe it (even if words got into the way of expressing it in storytelling form)? Words simply can’t capture the textures and colors that I see in my dreams. The Path Without End is a non-linear retelling of a traditional story that follows not just one version of the story, but many, and becomes one story in itself all at once. It’s a transformation and not one that fits within the beginning, middle, end structure. While some of my short stories are linear, more often than not I break away in non-linear realities with the aid of visual storytelling. While choosing your soundtrack, you went with a song from Cris Derksen, saying it reflected what you considered to be steampunk music. Could you speak a little more about that? Cris Derksen uses a traditional cello, but she modifies it with technology live. She simultaneously plays and remixes. I chose a raw track that got stuck in my mind after I listened to it. I played it over and over and over and dreamt on it for a long while. This track and others of hers speak to that mix of raw and refined, earth and technology, steampunk. I'd like to pick up on the comment on "raw and refined" as the combination that defines steampunk technology: do you think this paradoxical combo is what makes steampunk compelling to so many laypeople who don't specialize in technology? Contrasting it against the aesthetics of something like, say, the Apple machines, do you think steampunk particularly encourages all these colours and textures that you use in your work? For me, steampunk aesthetic is definitely an influence on the colors and textures of my work, but only so far as my Anishinaabe roots. I use copper, birch bark, and cowry shells, because these are meaningful to Anishinaabeg. In Our Words, a one-page comic for the Indigenous Narratives Collective edited by Arigon Starr, I use elements from various prior works for a mixed media story that relates the truth that Anishinaabeg had written language before birch bark scrolls were systematically burned in the process of colonization. This piece merges my use of steampunk aesthetic and the cosmos. It led later into The Nature of Snakes, a short new media piece that retells an Indigenous story about a girl who chances an encounter with a snake. My next work will transition from one aesthetic to the next—from copper automatons in steampunk style to earthly creations in greenpunk mode to the cosmos. Do you think that modern Victorian-focused steampunk is separate from the Anishinaabe steampunk you express? Indeed, Indigenous steampunk has many different expressions given the cultures it is based in. This means different materials and different way of knowings. I am disappointed with the “put a feather on it” simplicity of some interpretations of Indigenous steampunk. It can involve some Victorian elements, understanding the colonization of Indigenous peoples and lands of the time, but should seek to be Indigenous in depth. Anishinaabe steampunk, to me, sings out for beautiful beadwork of medicinal plants in clothing, copper canoes for space/time travel, and healing dances. Métis, my other side, calls out for my colorful sash worn like a man does, a leather hilt, carrying flint and steel, and any weapon of my liking. I see myself, many characters, and so many possibilities, especially if The West Was Lost is developed into a television series as promised. There have been attempts at "Native-ness" incorporated into steampunk that bank on stereotypes of what Indigenous people are like. What are your thoughts on the issue of non-Native appropriation of Indigenous imagery? Of course, I am opposed to misappropriation. However, I understand that this is often times out of ignorance, rather than someone being malicious. They often base their expression of Nativeness on representations in existing media. As more and more Indigenous artists take hold of our representations in media, the more awareness there will be. At the same time, it’s important for us to point out stereotypes when we see them. Recently, Gitxaala and British social media consultant Leena Minifie alerted the Indigenous media community to a music video by No Doubt that contained just about every stereotype possible (Gwen Stefani as the sexualized Indian princess prisoner, a wolf in a teepee, red smoke signals). Consequently, the video was taken down mere hours after it was posted online. What do you think steampunk could contribute to Indigenous art? Overall, the structure of steampunk calls for Indigenous art to return to tradition but also explore alternative technology. To look at Indigenous scientific literacies, as described by Grace Dillon in Walking the Clouds—a seminal anthology of Indigenous SF. To see and express back the technology that Indigenous people had and still have, that which is connected to the land, such as sustainable removal of precious metals, tending to plant life, and acknowledging the life that flows in all things. What, ultimately, do you envision our relationship to technology to be, within or without steampunk? In Cree new media artist Archer Pechawis' Memory (1997), he asked us: What is traditional? Can our use of technology be considered traditional? In this piece, he used a hide hand drum that ignites an electric current through wire to activate audio and video samples of elders speaking to these questions. We too have technology. We can also adapt Western-minded technology for Indigenous self-determination. We are interconnected with technology and have the power to use it for our representations and for expressing our ways of knowing. For indigenous people, especially indigenous youth, just starting to get into steampunk, what would you say to them? Every human being is an artist. We must look within to meet our muse, who we find to be ourself, the only voice whose opinion should inform our happiness. Look to your own culture and what inspires you, what makes your heart sing. Start somewhere small and make the next piece (whether clothing, a painting, jewelry, a short story, a poem) one more layer deep. I am still developing my skills and I always will be. I feel that I am at the very beginning of being able to tell the stories that come from my blood, my cells. I create, I complete, and I move forward. This is how I grow. It won't do you any good to get hung up on concepts of "perfection." Everything is perfect just the way it is. Elizabeth Aileen Dillon is currently based in Portland, OR, finishing her dissertation on Indigenous oral storytelling in gaming design. She has forthcoming publications in Nonverbal Communication in Virtual Worlds and Understanding Machinima and is a blogger at Aboriginal Territories in Cyberspace. Steampunk: Revolution is now out!